Jacob journeys on to his uncle Laban. Jacob falls in love with Rachel. Although he desires to marry Rachel, he is deceived by Laban into marrying Leah. Jacob’s mother Rebekah sent her son on a journey to the tents of his uncle Laban in order to find a wife. 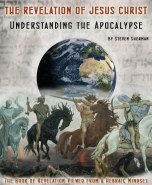 Jacob arrives at a well in the open country where shepherds are gathered to water their sheep. This scene closely parallels the events of Genesis 24 where the servant of Abraham was sent back to Abraham’s relatives to get a wife for Jacob’s father Isaac. The servant had his camels kneel down near the well outside the town of Nahor. At the well was Rebekah the granddaughter of Abraham’s brother Nahor and the sister of Laban. Abraham’s servant seeking a wife for Isaac arrived at a well outside of the town of Nahor and found Laban’s sister Rebekah. Now Jacob who is seeking a wife is at a well where Laban’s daughter Rachel has come to water her father’s sheep. Genesis 25:2 records that Esau was a skillful hunter, a man of the open country, while Jacob was content to stay at home among the tents. Jacob, who noted that the sheep should be taken back to the pasture, would later prove to be a skillful shepherd and breeder of flocks. Among the pastoral tribes the young unmarried daughters of the greatest elders tend the flocks, going out at sunrise and continuing to watch their animals until sunset. Watering them, which is done twice a day, is a work of time and labor. In volunteering his aid to the young shepherdess, Jacob demonstrated his willingness to be a productive member of his mother’s clan. Before the sheep could be watered by Jacob who was a shepherd, the stone had to be rolled away. Yeshua the good shepherd laid down His life for His sheep. He resurrected and the stone was rolled away from the tomb. Yeshua ascended to the right hand of the Father and sent the Holy Spirit to dwell within the believer. Now rivers of living water flow from within us. For the sheep to be watered, the stone had to be rolled away. Jacob was overcome with emotion and wept for joy. After his long lonely journey, he had met his cousin Rachel who he hoped would become his wife. Among pastoral people a stranger is freely entertained for three days. On the fourth day he is expected to tell his name and purpose. If he prolongs his stay after that time, he must set his hand to work in some way as agreed upon. In a similar fashion, Jacob had been working for Laban but just for his room and board. Now after a month, Laban realized that Jacob was an accomplished shepherd and wanted to employ Jacob on a long term basis. Laban’s older daughter, Leah, had weak eyes. The name Leah means “wearied” or “wild cow.” The dullness or weakness of her eyes was so notable that it is mentioned as a contrast to the beautiful form and appearance of her younger sister Rachel. Rachel had a lovely figure and was beautiful. The name Rachel means “ewe” – a female sheep. An old-fashioned expression is “to make sheep's eyes at somebody.” To make sheep eyes means to look at someone in a way that shows that you love them or are attracted to them. Jacob, who was a shepherd, was in love with the beautiful ewe with sheep eyes but was not attracted to a wearied cow with weak eyes. Diligently, patiently and faithfully Jacob worked as a servant for seven years to pay the bridal price for Rachel. Because of his strong romantic feelings, just being around Rachel made Jacob’s years of labor seem to fly by. Traditionally, an ancient wedding feast included wine. In John 2:1-11, the first miracle of Jesus recorded in the New Testament is when He changed water into wine at a wedding feast in Cana. After being betrothed for seven years and waiting to consummate his marriage, I am Jacob was in a mood to celebrate. The bride wore a veil that was only removed in the bridal chamber. In the dark of night and in high spirits, Jacob made love to Leah believing that she was Rachel. Jacob, who had deceived his father Isaac, hypocritically was incensed that he had been deceived by his uncle. Prompted by his mother Rebekah, Jacob wore a disguise and pretended to be his brother Esau. After his father had feasted, Isaac whose eyes were darkened with blindness was deceived by Jacob who stole his brother’s blessing. Now the tables have been turned. Prompted by her father Laban, Leah was disguised as Rachel. After a feast, Jacob was tricked because of Leah’s disguise and then in the darkness consummated the marriage with Rachel’s sister. In Jacob’s case of deception, the mother and son conspired together to deceive his father concerning his brother. In this instance, the father and daughter conspired together to deceive Rebekah’s son concerning Leah’s sister. The LORD gave Jacob a taste of his own medicine in order to start the process of sanctifying his character. 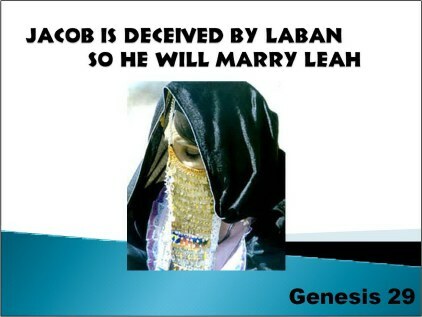 Even if it was the custom not to give the younger daughter in marriage before the older, Laban should have made that known before he entered into an agreement with Jacob. In any case, Laban intentionally set out to deceive Jacob for his own selfish purposes. Laban not only tricked Jacob into marrying Leah instead of Rachel, but extracted another seven years of labor from him in order to pay a second bridal price. Jacob did have feelings for Leah but those feelings paled in comparison to his love for Rachel. The names Leah gave her children, expressed her respect and regard, both to God and to her husband. Reuben (!bwar – Reuven, as it is pronounced in Hebrew) is a name that is a compound of two Hebrew words. “Re'u” means “look” or “see,” and “ben” means “son.” Literally the meaning of Reuben is, “behold a son.” The name Reuben expresses the fact that “re'u” - God saw my miserable situation, and therefore blessed me with a “ben” – a son. Leah gave birth to the firstborn son of Jacob. A firstborn son would be entitled to the birthright and would insure that the family name would be carried on. Leah believed that Jacob would be so pleased with her because she blessed Jacob with a son, that Jacob would love her and favor her as he did Rachel. Simeon (!w[mX – Shimeon in Hebrew) literally means “heard.” The name Simeon expresses the fact that the LORD “heard” of Leah’s plight and blessed her with a second son. Levi is translated from the Hebrew word, ywl (lay-vee) and means “joined to.” Leah hoped that at last Jacob would be romantically attached to her because she had given birth to three sons. Leah’s eyes were fixed upon her husband Jacob and she was in emotional distress because of her feelings of rejection. But Jacob and been deceived into marrying her and understandably he did not have the strong romantic feeling for Leah as he did for Rachel. The English name Judah is translated from the Hebrew word, hdwhy – Yehuda which means praised and is related to the Hebrew verb - lehodot, “to thank”. Leah finally realized that she should be thankful to God and give Him praise whether or not her child bearing would change Jacob’s feeling for her. In spite of her circumstances, Leah was thankful and gave the LORD a sacrifice of praise. At that time, she stopped bearing children for awhile. How is it possible to rejoice and be thankful even in difficult circumstances even if it is the will of God for the believer? We can stand in faith regardless of our circumstances because we know that God is working even the hardest situations for our good. Assured that we have a glorious eternal future, we can rejoice and be thankful regardless of difficult worldly trials. Genesis 30 - Jacob is Blessed with Many Children and Flocks!